Welcome back to another Dig Through Time, and I apologize for the delay between our last column and today’s. Just an FYI, this series is going to become slightly more intermittent, dropping down to once a month or so for the time being, as my family welcomed my second baby on November 21st (fingers crossed he’s a blue/black mage like dad.) With that out of the way, today we explore some of the forgotten cards from 1998-1999’s Urza’s block. This block gave us cycling, which you’ll no doubt recognize from Amonkhet block, and echo, which, sadly, saw its probably-last-ever printing in Future Sight. You may remember Urza’s block for being infamously broken, and there’s a ton of good, high-powered stuff in there like Academy Rector, Attrition, and Gilded Drake which are practically ubiquitous in EDH. While you may know about these and other popular cards from the block, when was the last time you took a stroll through Urza’s to find the underplayed gems? 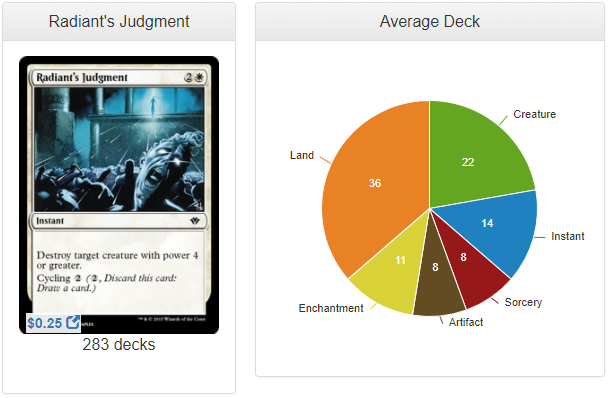 Radiant’s Judgment is a mono-white kill spell that sees play in 283 decks. This is a single activation of Intrepid Hero for three mana that you can cycle away if you don’t need it. Now, yes, you’re probably going to run Swords to Plowshares and Path to Exile first, but what are you putting in your third removal slot? Valorous Stance? (Okay, that one’s pretty awesome, and you should totally be running it.) Out of 710 legendary creatures, 314 of them have power four or greater, which makes this card relevant against them just less than half of the time. Whenever it isn’t going to do anything, you can replace it with something else for just two mana. Seems good! 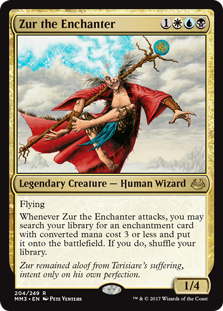 Zur the Enchanter plays this card the most at 116 decks, and I would 100% say that’s because of Astral Slide. If you’ve never seen an Astral Slide deck in action, treat yourself. The card is all of 25 cents, and the rest of the deck is relatively cheap. The deck has only gotten better with the recent infusion of cycling cards that have come out in Amonkhet block. Radiant’s Judgment is on-theme for Sidar Kondo of Jamuraa, and can even be safely run in Gaddock Teeg. 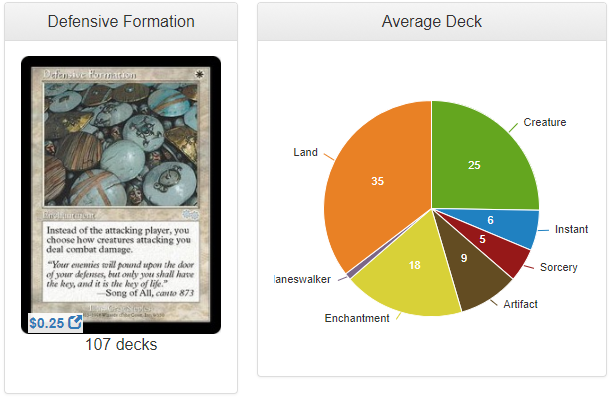 Defensive Formation is a strange, continuous combat trick that sees play in 107 decks. Here’s a fun fact about assigning combat damage, specifically from creatures with trample; you can always choose to assign more than lethal damage to a creature, which will save any extra blockers you employ and keep all the damage off of you. Let’s say an opponent attacks you with a Doomgape. You double block with a 1/1 soldier token and an Acidic Slime. Using Defensive Formation, you can assign all 10 of Doomgape’s power to the soldier token, killing it, but keeping you and your Acidic Slime safe, while the Doomgape dies to Slime’s deathtouch. There are tons of cool, weird tricks like this that you can pull with this innocent-looking enchantment. 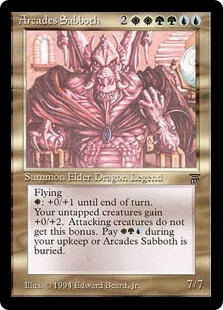 Why does Arcades Sabboth plays this card the most at seven decks? Really glad you asked. I have no idea. Maybe you can tell me? 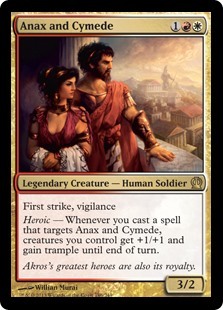 This card is great for decks that want to control combat, so commanders like Kynaios and Tiro of Meletis, Saskia the Unyielding, Queen Marchesa, and Odric, Master Tactician are all great candidates for Defensive Formation. Commanders with native deathtouch like Queen Marchesa, Atraxa, Praetors’ Voice and Ayli, Eternal Pilgrim are particularly good with Defensive Formation. First strike and double strike are good for similar reasons, and white has no shortage of commanders with those abilities. Teysa, Envoy of Ghosts has some really thought-provoking synergy with this card. Her protection from creatures means that she’s almost always going to survive combat, and her No Mercy effect means that you’ll be able to accrue spirit tokens to soak up any problematic trample damage. Daxos of Meletis, Ertai, the Corrupted, Zur the Enchanter and Hanna, Ship’s Navigator all love cheap enchantments. Daxos especially likes cards that play with combat, and this card is no exception. Definitely worth picking up. Purify is a board wipe for most nonland, noncreature permanents that sees play in 186 decks. 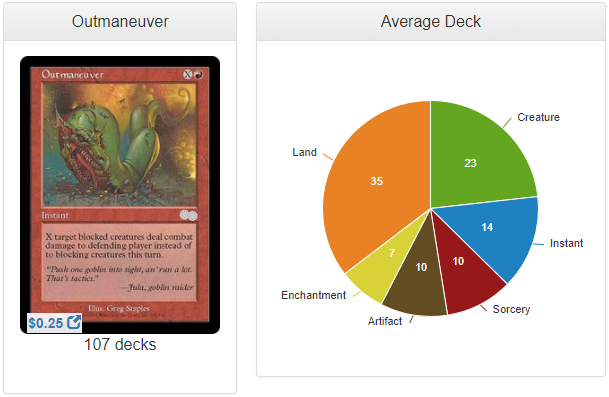 By comparison, Fracturing Gust is almost the same card and sees play in 770 decks. 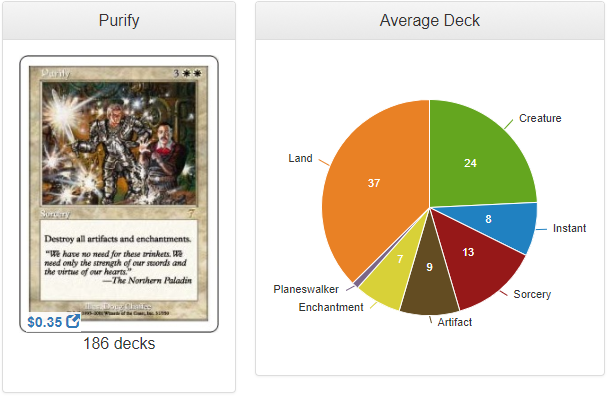 Purify goes in more decks due to its single-color identity, which makes it more versatile in that regard. It’s also comparable to Austere Command, though the modes you can select are locked. Like most board wipes, this is great for Superfriends decks. It’s also perfectly fine for creature-focused aggro decks. Never underestimate a board wipe that leaves creatures, as there is usually an abundance of artifacts and enchantments sitting around. At the very least, you’ll take out all of your opponents’ mana rocks. Sliver Overlord plays this card the most at 16 decks, and, as in the case of Arcades Sabboth playing Defensive Formation…I’m really not sure why. This is kind of a seemingly top-notch board wipe. Like most wrath effects, this card is great in Avacyn, Angel of Hope, since she protects all your stuff from getting blown up. Angus MacKenzie and Atraxa, Praetors’ Voice are two popular commanders for a Superfriends build; in both cases keeping your commander while destroying all of your opponents’ artifacts and enchantments can be extremely advantageous. 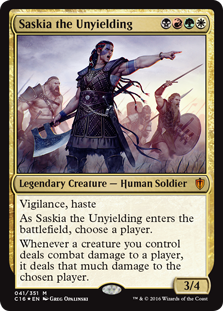 In the creature aggro camp, Saskia the Unyielding needs ways of dealing with things like Propaganda and Sphere of Safety. Wiping all of your opponents’ pillows, mana rocks and combo pieces, while leaving a table full of aggro beaters seems really strong for Saskia. 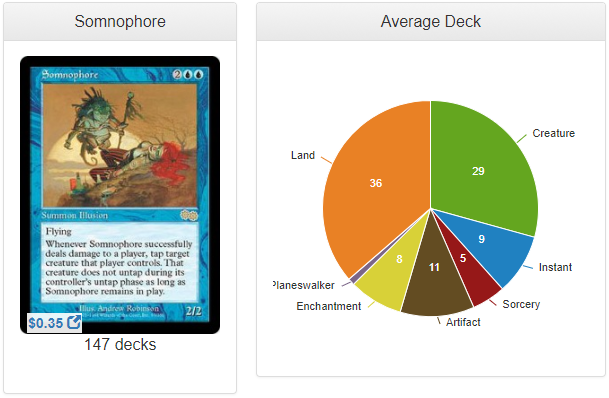 Somnophore is a very strange sort of a soft removal card that sees play in 147 decks. The effect is pretty similar to Neko-Te, though Neko-Te wants to hit the creatures and not your opponents (super secret tech for Ashling, the Pilgrim, by the way). There are definitely weird prison decks out there that want this card. Play it with stuff like Sleep, Tamiyo the Moon Sage, Tangle Wire, Borrowing 100,000 Arrows, and Kefnet’s Monument for a really bizarre theme deck. 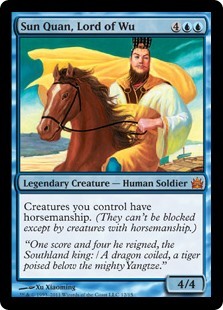 Sun Quan, Lord of Wu, who ensures that all your creatures connect with your opponents’ faces, plays this card the most at 23 decks. Kaseto, Orochi Archemage and Thassa, God of the Sea can also make sure that your Somnophore hits. This card has really high levels of synergy with Derevi, Empyrial Tactician, Teferi, Temporal Archmage, and other commanders that like to tap dance. Somnophore could also be a fun addition to an Isperia the Inscrutable flying tribal deck, if you’re into that sort of thing. 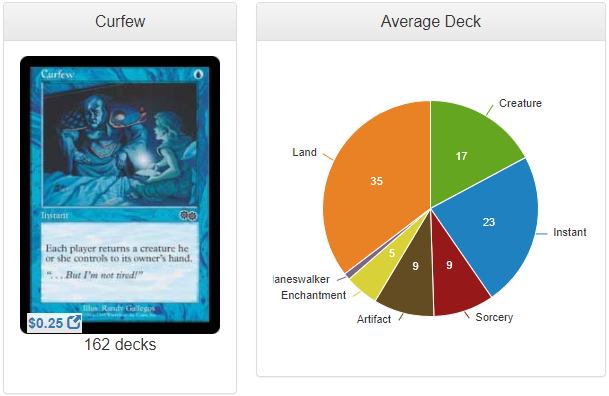 Curfew is a blue version of Innocent Blood that sees play in 162 decks. Unlike its black counterpart, this card is instant speed and has snappy flavor text to boot. We talked about Words of Wind in the last article and Curfew is a similar effect, but one that your opponents won’t see coming without a Telepathy effect. Like Words of Wind, Curfew is best used when you can get some extra value out of something like Nimble Obstructionist, Baleful Strix, or Snapcaster Mage, and one or more of your opponents have just tapped out to cast a bomb like Sheoldred, Whispering One. Talrand, Sky Summoner plays this card the most at 25 decks. Since he can bounce the drake he makes off the spell, the effect is basically one-sided. Low-to-the-ground creature-centric decks, like Sygg, River Cutthroat and Vela the Night-Clad, can easily recast their cheap creatures, possibly getting an extra use of an ETB, while simultaneously forcing your opponents back a step. In conjunction with a commander that doesn’t run very many creatures like Nekusar, the Mindrazer, you can hold Curfew back until you need to save your commander from a wrath or a targeted removal spell. Not bad at all. 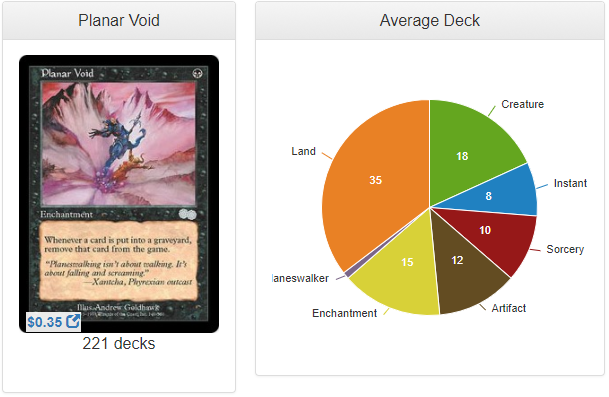 Planar Void is a Rest in Peace lookalike that sees play in just 221 deck. Two Hundred and twenty-one decks. That’s it. Rest in Peace sees play in 4,094 decks. That’s a difference of 3,783 decks. Like…how does that happen? This comes down a turn earlier and is nearly the same effect. Nearly. It’s worth noting that Planar Void removes the card when it goes to the graveyard, not if it would go to the graveyard. That means that your opponents will still get their death triggers. But whatever. So do you, and that means that this card still works with your Massacre Wurm, Harvester of Souls and Blood Artist. So good. Also, credit where credit is due, Nate Burgess is the one who turned me on to this card, so you can thank him. Phenax, God of Deception plays this card the most at 22 decks. Since mill decks are weak to Eldrazi Titans and other graveyard reshuffling effects, graveyard exile is very important to the strategy, and not everybody has $20 lying around for a Leyline of the Void. Apart from that, any black deck that doesn’t care about its graveyard should probably consider this card. I know Nate runs this in Oona, Queen of the Fae, and I run it in Mogis, God of Slaughter. You could even conceivably run this in nothing-but-instants Kess, Dissident Mage, since you can respond to Planar Void’s trigger and cast your spell a second time. It would be risky in that deck, though, so you’d really have to consider if your meta called for that much extra graveyard hate. Kalitas, Traitor of Ghet does surprisingly well with this card. He doesn’t care about reanimating his own creatures necessarily, and the fact that Planar Void says your opponents’ creatures still would go to the graveyard means that he still makes you a zombie token. Pick up a couple of these. 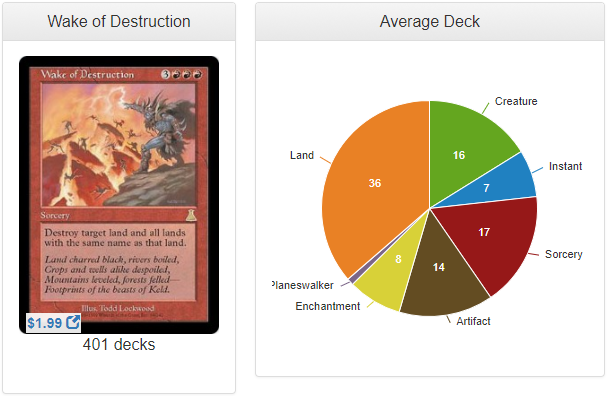 Wake of Destruction is a very specialized form of land destruction that sees play in 401 decks. Usually, mono-color decks don’t fear some of the more common land destruction effects like Ruination, but with this card, you can really make that mono-blue player hurt, and probably incidentally hit some of your other opponents as well. Sometimes it can be worth it to blow up two or more Reliquary Towers, Homeward Paths, Ancient Tombs, or other annoying lands that a couple of your opponents have managed to drop. 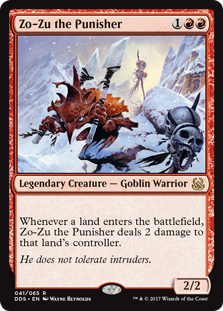 Zo-Zu the Punisher plays this card the most at 74 decks. 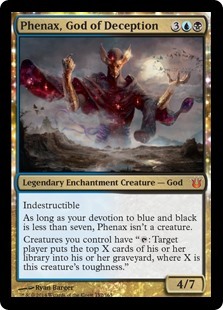 This is a great card to run in Neheb, the Eternal if your playgroup frowns on hard mass land destruction. Jhoira of the Ghitu could use this to hold your opponents lands hostage. A heavy ramp R/G commander like Omnath, Locus of Rage or Mina and Denn, Wildborn could probably find a scenario where this card shines. It’s worth a try. If you were building in R/W/x and really wanted to cause as much salt as possible you could run this with Iona, Shield of Emeria as a sort of redundant effect. Outmaneuver is a really fun combat trick that sees play in 107 decks. The nice thing about this card is that you can use it on your opponents’ creatures that are attacking other opponents and potentially kill off the attacking opponent’s creatures (assuming that the blockers are large enough). Let’s put that in context. Rick attacks Oliver with Omnath, Locus of Mana, Terastodon, and an Ulamog, the Ceaseless Hunger. Oliver is at nine life so he blocks Omnath with Acidic Slime while throwing a 1/1 elf druid token in front of both Terastodon and Ulamog. In response to blockers being declared (I know, I know, it’s not actually in response, but it’s a shorthand many playgroups use), Dean casts Outmaneuver targeting any or all of Rick’s creatures. Damage is dealt, Oliver dies and Omnath still bites it to Acidic Slime. Saskia the Unyielding plays this card the most at 23 decks, and it’s not hard to see why. Saskia is all about combat, and this card is a seriously cool combat trick. This is another great card for Neheb, the Eternal, if you decide to build around creatures rather than burn spells. Grenzo, Havoc Raiser is another commander that likes to sneak combat damage in; if you’re just looking to goad your opponents’ creatures, this card can get you there. 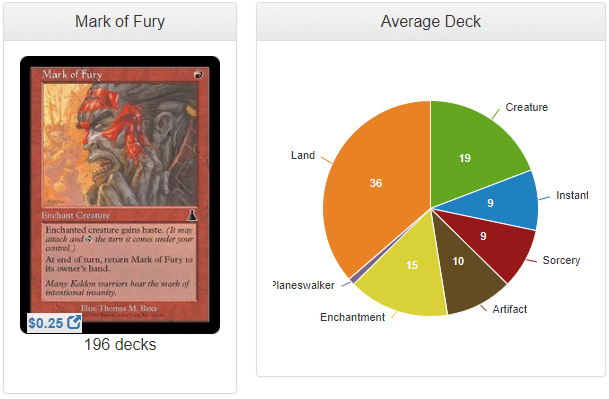 Mark of Fury is a nifty enchantment that lets you keep your creatures hasty and sees play in 196 decks. You could compare this card to Flamekin Village or Hanweir Battlements, except it costs one mana less to use each turn. The problem with cards that give your whole team haste like Hammer of Purphoros and Urabrask the Hidden is that they’re pretty easy to remove. Mark of Fury gives your opponents a relatively small window to get rid of the effect, and then you can choose to play it or not play it again next turn. Anax and Cymede play this card the most at 45 decks and get a heroic trigger each time you cast it. Two other red commanders that can or usually do run aura voltron strategies are Uril, the Miststalker and Shu Yun, the Silent Tempest; Shu Yun uses it somewhat like Anax and Cymede, while Uril gets a static bonus. Commanders like Niv-Mizzet, the Firemind that have tap abilities, and may run other creatures with tap abilities, might also want an effect like this. 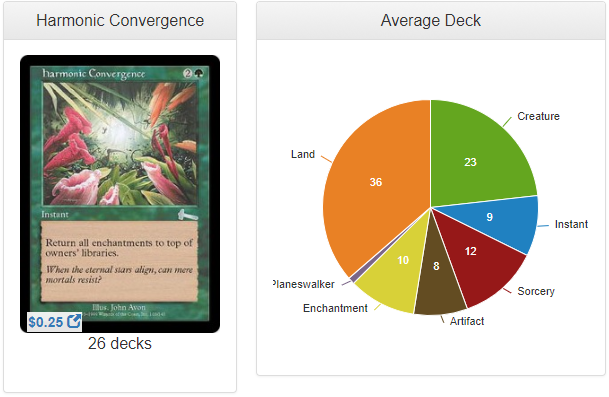 Harmonic Convergence is a mean enchantment hate card that sees play in 26 decks. Let’s get this out in the open before we go further: this card is extremely meta-dependant. If you aren’t playing against a Sigarda, Host of Herons, Uril, the Miststalker, Mogis, God of Slaughter, or Karametra, God of Harvests enchatress deck regularly, you probably shouldn’t run this card. But if enchantments are running rampant this card is going to be really nasty. It’s basically Plow Under for all enchantments for all players. Your opponents will be delighted when they get the chance to draw their bomb enchantments not just once, but twice or more. What fun! Harmonic Convergance is played so little that it doesn’t have a top commander. I’d say it’s generically goodstuff-y enough that it fits in any deck with green. Again, you’re not running this card because it has synergy with a particular commander, you’re running it because it hates out one or more of your opponents’ decks. Freyalise, Llanowar’s Fury has some enchantment hate baked in, so maybe start there, but the only limit to this card is going to be the number of enchantments you decide to run in your own deck. 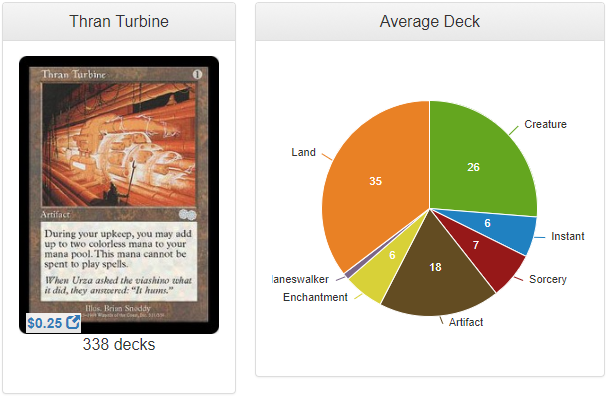 Thran Turbine is a free mana generator that sees play in 338 decks. Okay, it does also have to be used during your upkeep, or you’ll lose it, and you can’t use it to cast spells. Well, there are plenty of other uses for free mana, and having something like Leyline of Anticipation or Vedalken Orrery in play can help with the timing problem. Apart from that, there are tons of cards with activation costs that require colorless mana. You can pay for cards with cumulative upkeep using Thran Turbine. You can use this to power cards from the Words of Wind cycle. Mirror of the Forebears and Mirage Mirror are two recently printed cards that can make good use of two free mana during your upkeep. There are a ton more, just go looking for them. This card is my top hidden gem from this block. There are so many potential uses. 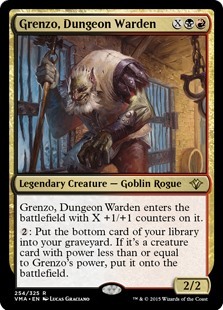 Grenzo, Dungeon Warden plays this card the most at 106 decks. 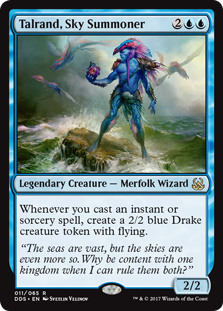 Thrasios, Triton Hero doesn’t even turn up in the top commanders for this card, which is insane to me. Coupled with Training Grounds, Thran Turbine is a free activation of Thrasios each upkeep. Roon of the Hidden Realm can use the mana to blink something until the end of turn. 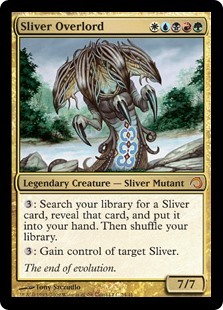 Higure, the Still Wind, Scion of the Ur-Dragon, Sliver Queen, Karn, Silver Golem, Patron of the Moon, are all commanders that have instant-speed activated abilities that require mana; any of them could make good use of this card. Kruphix, God of Horizons can store the mana indefinitely, though it will keep its non-spell restrictions. All Boros does is attack, right? Can’t draw cards. Can’t ramp. Super linear. Super boring. We’re all familiar with this issue. And who exemplifies the problem with boros design more than Adriana, Captain of the Guard? Well, today I decided to showcase a newer deck that I’m in the process of adding to my collection. Boros reanimator featuring none other than Adriana. The jumping off point for this deck was Bishop of Rebirth, which just came out in Ixalan, and, is essentially a third Sun Titan, the second being Custodi Soulcaller. The deck runs several wheel effects, the best one being Magus of the Wheel, which is relatively easy to recur. Wheeling through the deck is going to fill up the graveyard with Phoenixes, which can reanimate themselves, and with three CMC creatures (which come back thanks to Sun Titan and friends) that bring a friend with them when they enter the battlefield. Creatures like Pia Nalaar, Blade Splicer and Seller of Songbirds. These creatures allow us to swing wide without caring too much what happens to out attackers, since we can send inconsequential tokens at opponents that can block, just to trigger our team-wide melee thanks to Adriana. Aurelia, the Warleader and Waves of Aggression give you extra combat phases, allowing you to stack melee triggers on top of melee triggers, and allowing you to recur more cards from your graveyard with Sun Titan and Co. There’s even plenty of pseudo-ramp and pseudo-draw. This deck is still somewhat untested, but I’m very excited about it. I hope you enjoy it, and if you have any tweak suggestions please feel free to post them in a comment as the deck is still being iterated.